Hello everyone!! I hope you are all having a wonderful fall so far -- the weather here has been rather nice.... considering we have had nothing but rain all year. We have been expanding our product lines over the past couple of months and look forward to releasing a number of new products in the next couple of weeks (more on that in a later post I promise). I wanted to take this time to introduce our new team members. We are steadily growing and have started to bring on new members to fill roles that we no longer had time for. First is our new cider maker Alex. 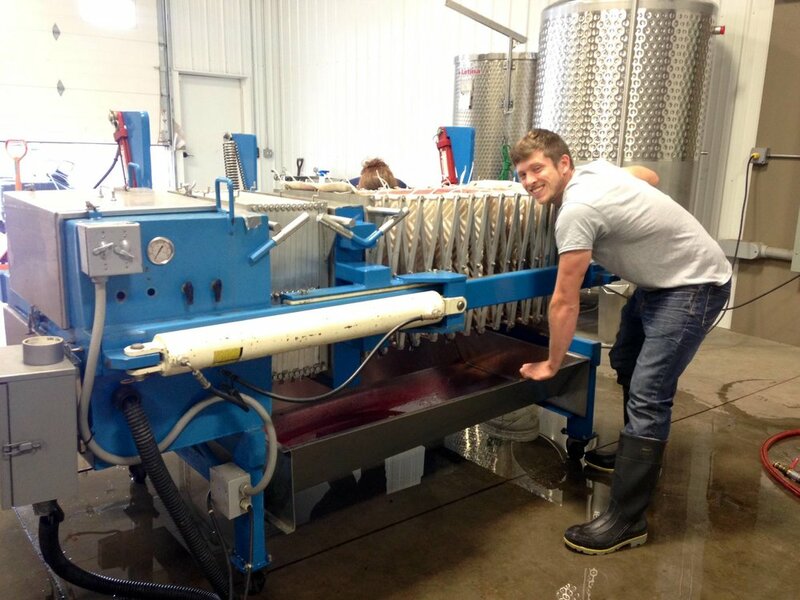 He comes to us by way of several wineries in the Finger Lakes and has been hard at work on a number of projects. Our first Hard Cider should be out in the next couple of weeks. The picture below is him pressing out Raspberries for our forthcoming fortified Raspberry Wine. Razzle Berry Raz Mataz. No that isn't the real name, but we like to sass him with it. Next is our new Director of Marketing and Brand Management. A fancy title that means he is in charge of sales and branding. Ethan comes to us by way of Red Jacket Cider and a number of other farm related companies in the Finger Lakes region as well. Both of them will be putting hours in at the tasting room so make sure to stop by and say hello! As always, drink local and drink responsibly. Cheers.